The son of a homesteader, Peter Lillehaug attended the Lutheran Normal School in the early 1900s. His son, Leland, attended Augustana and served on faculty for 35 years. His grandchildren, David, Steven and Laurie are each graduates. Today, the family represents three generations of Augustana’s history. The fabric of Augustana’s 153-year history is stitched with countless threads woven from looms all over the world. Some of the oldest and most colorful of those are from the Lillehaug family. 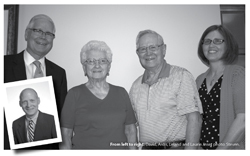 Dr. Leland Lillehaug ’51, the patriarch of the family today, says his connection with Augustana began with his parents, children of homesteaders who braved the wild and uncertain prairie to settle in Jerauld County, near Wessington Springs, S.D. In the early 1900s, Leland’s parents, Peter Lillehaug and Johanna Endahl, attended the Lutheran Normal School (located on what is today the Augustana campus). In 1918, the Lutheran Normal School merged with Augustana College, previously located in Canton, S.D. Leland attended school in Lane, S.D., and says he chose Augustana because of its affiliation with the Church. In 1944, with WWII still raging overseas, Lillehaug enrolled at the College as a freshman, uncertain about what he wanted to study. He says he briefly considered the pastoral ministry. In 1945, he put his college career on hold to return to the family farm to assist his father who had been injured in a farm accident. After his father recovered, Leland made the decision to enlist in the U.S. Army. He served two years, the last portion in the Panama Canal Zone. He was fortunate to be in an army band as a woodwind player and drum major. After returning home from the military, he re-connected with his childhood sweetheart, Ardis Scheel. They married in 1951 and recently celebrated their 62nd wedding anniversary. When he returned to Augustana in 1948, he made the decision to major in music and also pursued opportunities to be involved in the student body, even serving as president of the Augustana Student Association (ASA) his senior year. After graduating in 1951, he followed the encouragement of Dr. J. Earl Lee, Augustana music professor, and applied for, and earned, a Fulbright Scholarship to study music in Vienna, Austria. He later went on to earn his master’s degree and his doctorate from the prestigious Eastman School of Music in Rochester, N.Y. He was working as the high school band director in Waverly, Iowa, when Augustana President Lawrence Stavig approached him about returning to the College for a post as band director. 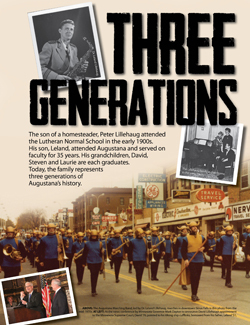 In 1956, Lillehaug returned to his alma mater to begin what would become a 35-year-long tenure at the College, during which he developed a robust band program and built the Augustana Marching Band, which, at its height, included 110 members. His wife, Ardis, helped design the Viking uniforms for the Augustana Marching Band. Today, she smiles at the memory of organizing the cutting and sewing of the distinctive and colorful navy and gold garments, which were accentuated with gold Viking helmets. Lillehaug also formed the Augustana Concert Band and the Varsity Band and helped build a highly popular band festival for high school band students. He also organized and led J-Term concert tours, taking the Concert Band around the U.S. on two buses. He served as director of bands for most of his 35 years at Augustana. During part of his tenure he also chaired the Music department. He continued to serve on the Music department faculty until 1991. His children, David, Steven and Laurie, say they virtually grew up on the Augustana campus. When it came time for his children to choose a college, Leland Lillehaug says he left the choice up to them. “I told them, ‘you can go to any college you want, as long as it’s Augustana,’” he remembers, laughing. David Lillehaug, class of 1976, enrolled at Augustana after being active on the debate team at Washington High School. He considered studying music, but eventually decided to major in political science. He counts Dr. Peter Schotten, professor of Government and International Affairs and Social Science Division chair, and Dr. Lynwood Oyos, professor emeritus of History, among his most significant mentors. After being active on the student council and debate team at Augustana, David took Schotten’s advice and went on to earn his juris doctorate from Harvard Law School in 1979. Over the next three decades, he would go on to build an impressive career, serving as law clerk to the Hon. Harry MacLaughlin, U.S. District Court, District of Minnesota; issues aide and executive assistant to the Hon. Walter Mondale; U.S. Attorney for the District of Minnesota from 1994-1998; and officer/shareholder at Fredrikson & Byron in Minneapolis. In March 2013, Minnesota Gov. Mark Dayton appointed him as associate justice to the Minnesota Supreme Court. At the news conference announcing the appointment, David proudly pointed out to reporters and others in attendance that he was wearing his father’s Viking ship cufflinks. Ardis remembers her middle child, Steven, as a kid who had a variety of interests, including science and history. A history major at Augustana, Steven Lillehaug graduated in 1979 and went on to earn his M.D. from the University of South Dakota School of Medicine. Board certified in anesthesiology and critical care medicine, he currently practices at Regions Hospital in St. Paul, Minn. His wife, Dr. Tanya Oyos, is a biology major from the class of 1982. Steven says an important aspect of being a student at Augustana was developing lifelong friendships. After serving as editor of the Washington High School student newspaper, Laurie (Lillehaug) Anderson enrolled at Augustana and majored in English/journalism. As a student, she served as editor of The Augustana Mirror, the College’s student newspaper. After graduating in 1982, she briefly worked for the Argus Leader in Sioux Falls. In 2001, she earned her master’s degree in education from St. Catherine University in St. Paul, Minn.
For the last 12 years, she has worked as a teacher. She currently teaches fifth grade at Calvin Christian School in Edina, Minn.
She counts Dr. Ron Robinson (English), Dr. Art Huseboe (English) and Drs. Lucy and Don Fryxell (English), among her early mentors as a student. Looking back on his family’s history with Augustana, Leland Lillehaug smiles. “As a student, I never thought I’d meet as many nice people in my life as I met at Augustana. Everyone at that place is so caring; so nice. I’ll always remember that,” he says. Return to The Augustana magazine.